Preheat the oven to 350F. Line 2 baking sheets with parchment paper. In a medium bowl, combine the oats, baking soda, salt and cinnamon. Stir to combine. In the bowl of a stand mixer, beat the almond butter, brown sugar, eggs, and vanilla until smooth, about 2 minutes. With the mixer on low, slowly add the oat mixture. Mix until combined. Stir in the chocolate chips. The dough will be very sticky! Scoop 2 tablespoon rounds of dough onto the prepared cookie sheets. Bake each batch for 9-11 minutes. Cool 2 minutes before removing from the cookie sheet. Transfer to a wire rack to cool completely. Enjoy! 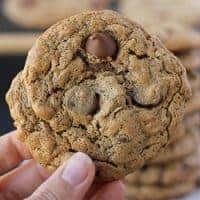 I use dairy-free chocolate chips from the brand Enjoy Life. Costco also sells a big bag of dairy-free chocolate chips.